Web technologies have become powerful enough that they are used to build full-featured applications; this has been true for many years in the desktop and laptop computer realm, but is increasingly so on mobile devices as well. This document summarizes the various technologies developed in W3C that increase the capabilities of Web applications, and how they apply more specifically to the mobile context. A good subset of these technologies are described and explained in the W3C on-line training on programming Web applications. This document is published by the Web and Mobile Interest Group; feedback on every aspect of this document should be sent to public-web-mobile@w3.org, the publicly archived mailing list of the interest group, or raised as issues on the Github repository, or alternatively to the author (dom@w3.org). It will serve as input for the next iteration of the document. The features that these technologies add to the Web platform are organized around the application foundations for the Open Web Platform, a set of high-level components that application developers rely on to build their Web-based content and services. The following application foundations are considered in this document: core web design and development, media and real-time communications, usability and accessibility, device interaction, application lifecycle, payment and services, performance & tuning, and security & privacy. In addition, it covers topics related to network integration. a link to the test suite for the said feature, and when relevant, a github ribbon to access the underlying git repository. “Editors drafts” represent the current view of the editors of the specification but have no standing in terms of standardization. “Working Drafts” (WD) are early milestones of the Working Group progress. “Last Call Working Drafts” signal that the Working Group has determined that the specification fulfills its requirements and all the known issues have been resolved, and thus requests feedback from the larger community. “Candidate Recommendations” (CR) trigger a call for implementations where implementors are invited to implement the specification and send feedback; Working Groups are expected to show the specification gets implemented by running test suites they have developed. “W3C Recommendations” (Rec) are stable and completed Web standards; these documents only get updated rarely, through the “Edited Recommendation” process, as a results from errata collected by Working Groups. For groups that have adopted it, the 2014 update of the W3C Process simplifies a bit the progression by removing the Last Call stage — instead of a single global call for review addressed to the whole community, Working Groups are empowered with solicitting reviews from their various related communities as long as they can demonstrate sufficient wide review of the specification before requesting transition to Candidate Recommendation. Prior to starting standardization, a Working Group needs to be chartered, based on input from W3C Members, often through the organization of a workshop, or after the reception of a W3C Member Submission. W3C has set up Community Groups, a mechanism that allows anyone to do experimental work within the W3C infrastructure, under IPR rules that are compatible to transition the work to the W3C standardization process. SVG, Scalable Vector Graphics, provides an XML-based markup language to describe two-dimensions vector graphics. Since these graphics are described as a set of geometric shapes, they can be zoomed at the user request, which makes them well-suited to create graphics on mobile devices where screen space is limited. They can also be easily animated, enabling the creation of very advanced and slick user interfaces. The integration of SVG in HTML5 opens up new possibilities, for instance applying advanced graphic filters (through SVG filters) to multimedia content, including videos. SVG 2.0 is set to facilitate that integration and complete the set of features in SVG. In complement to the declarative approach provided by SVG, the <canvas> element added in HTML5 enables a 2D programmatic API that is well-suited for processing graphics in a less memory intensive way. That API not only allows rendering graphics, but can also be used to do image processing and analysis — HTML 5.1 adds the ability to do that processing in a separate Web Worker. Both SVG and HTML can be styled using CSS (Cascading Style Sheets); in particular, CSS3 (the third level of the specification) is built as a collection of specifications set to offer a large number of new features that make it simple to create graphical effects, such as rounded corners, complex background images, shadow effects ( CSS Backgrounds and Borders ), rotated content ( CSS Transforms , including with 3D effects). Animations can be described declaratively via CSS Animations , and CSS Transitions . Animations can also be managed via scripting through the API exposed in Web Animations; as they can be resource intensive, the possibility offered by the Timing control for script-based animations API to manage the rate of updates to animations can help keep them under control. To ensure optimal performances when animating parts of an app, authors can make use of the CSS will-change property to let browsers compute the animation ahead of its occurrence. An early proposal for Web Navigation Transitions would enable animations that occur when navigating from one page to another. CSS Flexbox allows to build complex layouts as required for interactive applications on small screens. Fonts play also an important role in building appealing graphical interfaces, but mobile devices are in general distributed with only a limited set of fonts. WOFF 1.0 ( Web Open Font Format ) addresses that limitation by making it easy to use fonts that are automatically downloaded through style sheets, while keeping the size of the downloaded fonts limited to what is actually needed to render the interface. The upcoming WOFF 2.0 update to that format promises 25%-smaller download sizes; on mobile, a 35% reduction in the time needed to download and display these fonts has been measured. Given the time required for downloading fonts over mobile networks, authors need to adapt their content to the progressive availability of fonts; CSS Font Loading gives the necessary events to developers to enable that adaptation. Another important aspect in graphics-intensive applications (e.g. games) is the possibility to use the entire screen to display the said graphics; the work on a Fullscreen API to request and detect full screen display, previously co-developed by the Web Applications and CSS Working Groups, has now fully moved to the WHATWG. Likewise, in these scenarios, it is often useful to be able to lock the orientation of the screen; the Screen Orientation API allows not only to detect orientation change, but also to lock the orientation in a specific state. NB: a 3D graphic API for HTML5 canvas, called WebGL, has been developed outside of W3C, as part of the Khronos Group; this API has been built to be compatible with OpenGL ES, i.e. for embedded systems, and is intended to work on mobile devices. Mobile devices not only differ widely from traditional computers, but they also have a lot of variations among themselves, in term of screen size, resolution, type of keyboard, media recording capabilities, etc. The Device Description Repository API is a unified server-side API that allows Web developers to retrieve data on the devices that are accessing their pages on a variety of device information database. The Media Capture and Streams API exposes some specific information on capabilities of camera and microphones to make it possible to take advantage of the large variety of media capturing devices provided on mobile phones. CSS Media Queries offer a mechanism that allows adapting the layout and behavior of a Web page based on some of the characteristics of the device, including the screen resolution — to which Media Queries Level 4 proposes to add the availability and type of a pointing device, the ability to hover over elements, and the ambient luminosity. It also lets developers the ability to define media queries that react to script-defined variables, making it easier to integrate these adaptation rules in the overall logic of the app. CSS Device Adaptation defines a set of CSS directives to define the size on which this layout should be based, relatively to the size of the underlying device — specifying what has been implemented using the <meta name="viewport"> element so far. The viewport-relative CSS units vw and vh let design layouts that adapt to the dimensions of the viewport, while CSS Mobile Text Size Adjustment lets text adapt to zoomed parts of a page. The Responsive Images Community Group (RICG) developed an extension to HTML, known as the picture element, that allows authors define what image to load depending on device capabilities and/or other media features. As a complementary approach, the srcset attribute, specified by the WHATWG and also published as an extension to HTML, let Web developers define the various device pixel ratios of an image, letting the browser pick the best choice for the pixel density of the screen. As of January 2014, there is general agreement amongst browser vendors to implement both picture and srcset. SVG, which lets define images that can be scaled up and down without any loss of quality, is another critical tool to the development of Web applications that adapt to the resolution of the underlying device. the <datalist> element allows creating free-text input controls coming with pre-defined values the user can select from; HTML 5.1 defines a mechanism for the autocomplete attribute to automatically fill input fields based on well-known data for the user. Support for inputmodeSupported in Safari on iOS unknown? Supported in Internet Explorer on Windows Phone unknown? Supported in Firefox mobile unknown? Supported in Android browser unknown? Supported in Opera mobile unknown? Supported in Chrome for Android unknown? A critical component of many applications is the ability to save state, export content, as well as integrate data from other files and services on the system. For simple data storage, the Web Storage specification offers two basic mechanisms, localStorage and sessionStorage, that can preserve data respectively indefinitely, or on a browser-session basis. For richer interactions, the Web platform provides the File Reader API makes it possible to load the content of a file. Discussions have started on a new proposal for a sandboxed filesystem API. Meanwhile, the HTML5 download attribute provides a simply mechanism to trigger a file download (rather than a page navigation), with the possibility of setting a user-friendly filename. As more and more data need to be stored by the browser (e.g. for offline usage), it becomes critical for developers to get reliable storage space, which the proposed Quota Management API will offer to Web applications. Communication applications can benefit from integrating with their users’ existing data records; on mobile devices, the address book is a particularly useful source of information. For Web apps outside of the browser, a purely programmatic approach was part of the System Applications Working Group; since this group has now closed, no further work on the Contacts Manager API is expected for the time being. In the browser, HTML 5.1 provides autocompleted fields for contacts information that would let browsers re-use data from addressbooks. Some of this data need to be encrypted, the Web Cryptography API from the Web Cryptography Working Group exposes strong cryptography primitives to Web applications, and can be bound to pre-provisioned keys via the WebCrypto Key Discovery API. HTML5 adds two tags that dramatically improve the integration of multimedia content on the Web: the <video> and <audio> tags. Respectively, these tags allow embedding video and audio content, and make it possible for Web developers to interact much more freely with that content than they would through plug-ins. They make multimedia content first-class citizens of the Web, the same way images have been for the past 20 years. To cater for the needs of some content providers, a proposal to enable playback of protected content, Encrypted Media Extensions is an API that is under consideration in the HTML Working Group. Mobile devices often expose shortcuts to handle the audio output of a main application (e.g. a music player) from a lock screen or the notification areas. The WHATWG Media Session specification proposes deeper integration with these features in Web applications. Because mobile devices often come with a variety of configurable audio output (phone speaker, loudspeaker, headset, bluetooth speakers), the Audio Output Devices API let developers set on which ouput devices a given audio resource should play. While the new HTML5 tags allow to play multimedia content, the HTML Media Capture defines a markup-based mechanism to access captured multimedia content using attached camera and microphones, a very common feature on mobile devices. The Web Real-Time Communications Working Group and the Device APIs Working Group are building together an API (getUserMedia) to directly manipulate streams from camera and microphones, as well as an API to record these streams into files, and another API to use access to cameras to take photos programatically. Beyond capturing and recording, two additional APIs add multimedia manipulation capabilities to the Web platform. We have already mentioned the Canvas 2D Context API: it enables modifying images, which in turn opens up the possibility of video editing. In a similar vein, the Audio Working Group is working on an API that that makes it possible to modify audio content, as well as analyze, modify and synthesize sounds, the Web Audio API. The Network Service Discovery API offers to discover services on the local network (such as the ones offered via DLNA), enabling mobile Web applications to integrate seamlessly with these services. An alternative proposal to the Network Service Discovery API has emerged: Named Web Sockets offers to provide well-known sockets to existing and approved local network services. The Second Screen Presentation Working Group is building an an API to request display of content on an external screen, including through network-based protocols, forming the basis for second-screen scenarios. P2P Audio and video streams allowing for real-time communications between users. The combination of all these features marks the starting point of the Web as a comprehensive platform for multimedia, both for consuming and producing. The rising interest around bridging the Web and TV worlds (manifested through the W3C Web and TV Interest Group) should strengthen that trend in the coming months. Mobile devices are expected to take a growing role in many users TV experience, providing a “second screen” experience, where users can find more information on or interact with a TV program they're watching via their mobile devices. Likewise, the opportunity offered to deploy real-time communication services on the Web is another step towards the unification of the telecommunication and Web ecosystems. An increasing share of mobile devices relies on touch-based interactions. 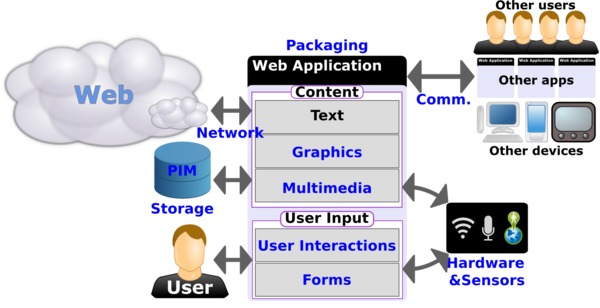 While the traditional interactions recognized in the Web platform (keyboard, mouse input) can still be applied in this context, a more specific handling of touch-based input is a critical aspect of creating well-adapted user experiences, which Touch Events in the DOM (Document Object Model) enable. The work on that specification is now nearly finished. Meanwhile, the Pointer Events Working Group has made good progress on an alternative approach to handle user input, Pointer Events, that allows to handle mouse, touch and pen events under a single model. It provides a complementary and more unified approach to the currently more widely deployed Touch Events. In particular, the CSS property touch-action that lets filter gesture events on elements is gaining traction beyond implementations of Pointer Events. The early proposal for an InputDevice capabilities API would provide information about a given “mouse” event comes from a touch-capable device. As more and more content gets rendered as long scrollable lists, more and more logic is attached to scrolling events, and the quality of the user experience of these actions is highly dependent on their performances. The CSSOM View Module determines when scrolling events get fired, and let developers specify the type of scrolling behavior they want. The proposed work on CSS Scroll Snap Points adds greater ability to control the behavior of panning and scrolling by defining points to which an app view would snap when the user moves through the page. The CSS will-change property is also available to indicate to browsers that a given part of the page will be soon scrolled to and should be pre-rendered. Many mobile devices use on-screen keyboards to let users type; the Input Method Editor (IME) API makes it possible to coordinate the interactions between that on-screen keyboard and Web applications, but the future of that API is under discussion given its relative lack of adoption. Conversely, many mobile devices use haptic feedback (such as vibration) to create new form of interactions (e.g. in games); work on a vibration API in the Device APIs Working Group is making good progress. But as the Web reaches new devices, and as devices gain new user interactions mechanisms, it also becomes important to allow Web developers to react to a more abstract set of user interactions: instead of having to work in terms of “click”, “key press”, or “touch event”, being able to react to an “undo” command, or a “next page” command independently of how the user instructed it to the device will prove beneficial to the development of device-independent Web applications. The IndieUI Events specification, developed by the Indie UI Working Group, aims at addressing this need. Mobile devices follow their users everywhere, and many mobile users rely on them to remind them or notify them of events, such as messages: the Web Notifications specification enables that feature in the Web environment, while the Push API makes it possible for server-side notifications to alert the user, even if the browser is not running. Whether users are speaking commands to their apps or working with them through non-haptic interactions, they risk seeing the screens turned off automatically by their devices screensaver. An early proposal for a Wake Lock API would let developers signal the needs to keep the screen up in these circumstances. The hardware constraints of mobile devices, and their different usage context can make mobile users experience similar barriers to people with disabilities. These similarities in barriers mean that similar solutions can be used to cater for them, making a Web site accessible both for people with disabilities and mobile devices a natural goal (as detailed in Relationship between Mobile Web Best Practices and WCAG). The WCAG and UAWG Working Group provide guidance on mobile accessibility in how Web Content Accessibility Guidelines (WCAG) and other WAI guidelines apply to mobile — that is, making websites and applications more accessible to people with disabilities when they are using mobile phones and a broad range of other devices. WAI-ARIA provides semantic information on widgets, structures and behaviors hooks to make Web applications more accessible, including on mobile devices. Mobile devices are packed with sensors, making them a great bridge between the real and virtual worlds: GPS, accelerometer, ambient light detector, microphone, camera, thermometer, etc. To take full advantage of these sensors in mobile Web applications, Web developers need to be provided with hooks to interact with them. The Geolocation API provides a common interface for locating the device, independently of the underlying technology (GPS, WIFI networks identification, triangulation in cellular networks, etc.). Work towards a new geofencing API (i.e. an API to detect when a device enters a given geographical area) has started. Web applications can also now access orientation and acceleration data via the DeviceOrientation Event Specification . A number of APIs for other sensors are under development: the Battery Status API, the Proximity Events API, the Ambient Light Events API or the proposed Ambient Humidity Events API. The Device APIs Working Group has started an effort to propose a unification pattern for these various sensors. As already mentioned in the section on multimedia, there is ongoing work on APIs to open up access to camera and microphone streams. The NFC Working Group had been chartered to develop APIs for accessing from Near-Field Communications systems to Web runtimes, but outside the traditional Web security model; as the need and requirements to bring NFC interactions under that model have become clearer, the existing NFC Working Group has been closed, and work on browser-compatible NFC API has started in the Web NFC Community Group. A Web Bluetooth Community Group was started to develop a Bluetooth API for browsers with a particular goal of supporting Bluetooth Low Energy devices. Network connectivity represents a major asset for mobile devices: the Web is an immense store of content, as well as an almost endless source of processing power, overcoming two of the limitations of mobile devices. The Web platform is growing a number of APIs that facilitate establishing network connectivity in different contexts. XMLHttpRequest (the basis for Ajax development) is a widely deployed API to load content from Web servers using the HTTP and HTTPs protocol: the W3C specification (formerly known as XMLHttpRequest Level 2 ) was meant to document the existing deployed API (with the ability to make requests on servers in a different domain, programmatic feedback on the progress of the network operations, and more efficient handling of binary content), but that work is now likely to be done only in the WHATWG. The WHATWG fetch API also provides a more powerful Promise-based alternative. The Beacon API aims at letting developers queue unsupervised HTTP requests, leaving it to the browser to execute them when appropriate, opening the door for better network optimizations. Early work on a Web Background Synchronization API would provide a robust Service Worker-based mechanism to enable Web applications to download and upload content in the background, even in the absence of a running browser. By default, browsers do not allow to make request across different domains (or more specifically, across different origins, a combination of the protocol, domain and port) from a single Web page; this rule protects the user from having a Web site abusing their credentials and stealing their data on another Web site. Sites can opt-out of that rule by making use of the Cross-Origin Resource Sharing mechanism, opening up much wider cooperation across Web applications and services. Early work on a Push API would allow Web applications to receive server-sent messages whether or not the said Web app is active in a browser window. An IETF Working Group charter is under discussion to standardize the protocol aspects of the mechanism. The WebSocket API , built on top of the IETF WebSocket protocol , offers a bidirectional, more flexible, and less resource intensive network connectivity than XMLHttpRequest. The work on Web Real-Time Communications will also provide direct peer-to-peer data connections between browsers with real-time characteristics, opening the way to collaborative multi-devices Web applications. Of course, an important part of using network connectivity relies on being able to determine if such connectivity exists, and the type of network available. The HTML5 onLine DOM flag (and its associated change event, ononline) signals when network connectivity is available to the Web environment. The network-information API, which was supposed to address discovery of the network characteristics, has been abandoned for the time being due to lack of clear supporting use cases. The Resource Timing API offers to measure precisely the impact of the network on the time needed to load various resources, offering another approach to adapt a Web app to its network environment. An important aspect of the user experience of applications is linked to how the user perceives the said application is available permanently (even when off-line, which is particularly important on mobile devices), as well as its ability to get started based on external notifications. These notions are part of the overall application lifecycle: how applications get installed, shown to the user in applications list, started, stopped, woken up from remote notifications, synced up when the device goes on-line. These various capabilities are brought the Web platform through different mechanisms. Although the notion of installed Web applications is still not well-defined, there are several components to the notion of installation that are under development. Packaging on the Web describes a Web-adapted format to make Web content available in a singe file for ease of download, sharing or archiving. Whether packaged or not, users rely on a variety of metadata (name, icons) to identify the apps they want to use among their list of regularly used applications. The JSON-based manifest format lets developers group all these metadata in a single JSON file. HTML5’s ApplicationCache enables access to Web applications off-line through the definition of a manifest of files that the browser is expected to keep in its cache. While relatively well deployed, the current approach has shown some strong limitations in terms of how much developers can control what gets cached when. The Web Applications Working Group has thus been developing a more powerful approach, ServiceWorker. Not only does Service Worker enables Web applications to work seamlessly off-line or in poor network conditions, it also creates a model for Web applications to operate when they have not been opened in a browser window, or even if the browser itself is not running. That ability opens the door for Web applications that run in the background and can react to remotely triggered events. The Task Scheduler API makes it possible to trigger a task at a specified time via the Web app service worker. While the System Applications Working Group in which this API was developed has closed, the ServiceWorker-based approach taken in the specifications may make it an interesting starting point for further work in this space. Similarly, the new geofencing API enables to wake up a Web app when a device enters a specified geographical area. The Push API enables Web applications to subscribe to remote notifications that, upon reception, wake them up. Native applications have long enjoyed the benefits of greater user engagement that these notifications bring, and soon Web applications will share that ability. Likewise, the Web Background Synchronization specification will enable Web applications to keep their user data up to date seamlessly, by running network operations in the background. The Page Visibility specification lets developers detect when their application is in the foreground, and thus adapt their operations and resource consumption accordingly. Native mobile application stores have made it much easier for developers to monetize some of their applications, either by selling the application itself to users, or by providing in-app purchases. While Web applications can use well-known on-line payment solutions, these solutions have so far proved much harder to use on mobile devices. In March 2014, W3C organized a workshop on Web payments to identify ways in which standards could help make that payment experience much simpler, in particular on mobile devices. In Octobober 2014, W3C chartered the Web Payment Interest Group to drive work in this space, and that group released its sense of priority use cases for Web payments. A charter for a Web Payments Working Group is now under review by the W3C Advisory Committee: this group, if chartered, would develop a browser API to facilitate payment operations in Web apps. Meanwhile, HTML5.1 provides specific help for autocomplete of credit card details, making it easier to pay via credit cards once these details have been entered once. Due to their limited CPU, and more importantly to their limited battery, mobile devices require a lot of attention in terms of performance. The work started by the Web Performance Working Group on Navigation Timing , Resource Timing , Performance Timeline and User Timing , gives tools to Web developers for optimizing their Web applications. The work on the Frame Timing API aims at providing detailed information on the frame-per-second obtained when an application is running on the user device. The Resource Hints and Preload specifications let developers optimize the download of resources by enabling to delay either the download or the execution of the downloaded resource. The proposed work on Efficient Script Yielding offers the opportunity to Web developers to use more efficiently asynchronous programming, but has so far gained very limited traction. The requestIdleCallback API similarly proposes a way for scheduling an operation at the next opportunity when the app is not processing another operation. The API to determine whether a Web page is being displayed ( Page Visibility API ) can also be used to adapt the usage of resources to the need of the Web application, for instance by reducing network activity when the page is minimized. Likewise, the Timing control for script-based animations API can help reduce the usage of resources needed for playing animations. Beyond optimization of resources, the perceived reactivity of an application is also a critical aspect of the mobile user experience. The thread-like mechanism made possible via Web Workers allows keeping the user interface responsive by offloading the most resource-intensive operations into a background process. The battery API allows adjusting the use of resources to the current level of power available in the battery of a mobile device. The Mobile Web Application Best Practices provide general advice on how to build Web applications that work well on mobile devices, taking into account in particular the needs for optimization. The opportunity to update these best practices is under discussion in the Web and Mobile Interest Group. Editing activity for Last updated September 2015 October 2014O 2 commits in October 2014 November 2014N 2 commits in November 2014 December 2014D 3 commits in December 2014 January 2015J 0 commits in January 2015 February 2015F 0 commits in February 2015 March 2015M 0 commits in March 2015 April 2015A 7 commits in April 2015 May 2015M 0 commits in May 2015 June 2015J 3 commits in June 2015 July 2015J 6 commits in July 2015 August 2015A 4 commits in August 2015 September 2015S 1 commits in September 2015 2014 2015 Commits on ed. draft None? Mobile devices follow their users everywhere, and hold some of their most private or confidential data (contacts, pictures, calendar, etc.) As a result, it is critical for users to be able to rely on their phones to keep that data safe from attackers. W3C specifications are reviewed for their security and privacy impact as part of their progress through the Recommendation track; the Privacy Interest Group and the Web Security Interest Group in particular are coordinating reviews on their respective fields. Many sensitive APIs are gated by a request for user consent; while these requests give control to the user, they can be sometimes hard to integrate in the overall user experience without visibility on which permission has been granted or denied. The Permissions API aims at fixing this. But beyond these cross-technology considerations, a number of ongoing work items address needs for additional protection. The first line of defense for users, and the unit of isolation for Web apps is the same-origin policy that roughly limits what a Web application can access to content and data hosted on the same origin, i.e. the combination of URL scheme, domain name and port. For legacy reasons, this policy is not as stringent on some parts of the Web platform, exposing users to greater attack surface via cross-site scripting or cross-site request forgery. To enable Web application authors to reduce the attack surface beyond what legacy requires, the Content Security Policy (level 2) offers hooks that severely limits damages that an attacker could hope to achieve. To further strengthen the integrity of their applications, Web developers can make use of the proposed Subresource integrity mechanism, that makes it possible to block man-in-the-middle attacks or compromised third-parties providers. Entry Point Regulation provides another layer of strengthening and offers to filter the type of HTTP requests that can be made from external sites, reducing risks of cross-site script and cross-site request forgery. In applications that aggregate content from multiple (possibly untrusted) sources, the HTML5 iframe sandbox makes it possible to restrict what kind of interactions third-party embedded content can make use of. As described earlier, the Web Cryptography API provides the necessary tools to encrypt data for storage and transmission from within Web applications, with access pre-provisioned keys via the WebCrypto Key Discovery API. There are discussions to bring the capabilities of hardware-security modules to the Web, to enable access to high-security operations for encryption, payment, identity proof, etc., embodied in a draft charter for a Hardware Security Working Group. For users that wish to indicate their preferences not to be tracked across Web applications and sites, the Tracking Preference Expression (also known as Do No Track) enables browsers to communicate explicitly their wish to content providers, and to determine whether a given content provider asserts fulfilling that wish. To facilitate the authentication of users to on-line services, the Web Application Security Working Group is proposing a credential management API that lets developers interact more seamless with user-agent-managed credentials. Thanks to Art Barstow, Anssi Kostiainen, Jo Rabin, J. Manrique López, Mounir Lamouri, Marcos Caceres, François Daoust and Ronan Cremin for their contributions to this document. This document is produced through the HTML5Apps project, funded by the European Union through the Seventh Framework Programme (FP7/2013-2015) under grant agreement n°611327 - HTML5 Apps.